New year, new election to start preparing for. Registered voters should start thinking about the 2020 presidential election. Even though Nov. 3, 2020 seems like it’s lightyears away, it’s never too early to become informed about what each candidate stands for. Maybe trying to decide on who to vote for now will help you avoid all the confusion and mind games that come with excessive media coverage closer to the election time. Some politicians have already announced their candidacies. Obviously, President Trump will be running for re-election. He announced this on Jan. 20, 2017: the day of his inauguration. His campaign promises to, “Keep America Great.” Its website’s front page has a video from the Midterm elections in Nov. urging voters to vote Republican to “stop the radical Pelosi Democrat agenda.” Personally, I am not looking forward to another four years of divisive rhetoric and temper tantrums from Trump, but clearly, he is not going to leave office without a fight. Andrew Yang, an entrepreneur, will be running in the Democratic party. He announced his candidacy in Nov. 2017. His campaign promises to give a $1,000 universal basic income to all Americans. It’s not a bad idea, but at this moment, it seems pretty unrealistic. Yang asserts that he is different from Trump. Hawaii Democratic Rep. Tulsi Gabbard will also join the race. She announced her candidacy in an interview with CNN on Jan. 11. 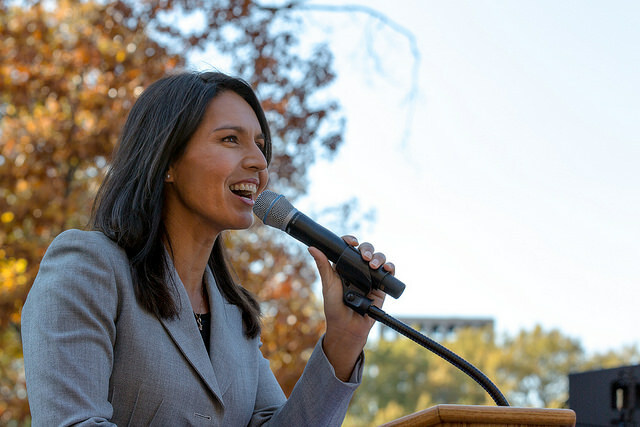 Gabbard is an Iraq war veteran, which explains some of her stances on the issue of war. “There is one main issue that is central to the rest, and that is the issue of war and peace,” she said in the interview with Van Jones. However, Gabbard is already coming under fire for some of her actions in the past. In 2002, she spoke in an interview with Honolulu Star-Bulletin about working for The Alliance for Traditional Marriage, her father Mike Gabbard’s political committee, which focused on creating anti-gay legislations. Generally, I notice that younger candidates have fresher ideas that appeal to me and voters of a similar demographic. Yang is 43 years old and Gabbard is 37. Despite what I know about them already, maybe they will surprise us all in the election with some forward-thinking policies and ideas that are appealing to young voters like me, who will greatly impact the 2020 election outcome. There are several other candidates who have confirmed their spot in the 2020 race: Massachusetts Senator Elizabeth Warren, former Housing and Urban Development Secretary Julian Castro, former Maryland Rep. John Delaney and West Virginia State Senator Richard Ojeda. More information about each of these candidates will be released as the election inches closer, but voters should take this time to get a head start. Don’t let any unfair bias or misinformation guide you in your decision making; do your own research.